U.S. General Officer Pistols Rigs Model 1903 .32 and 1908 .380 (Model M) with original General officer belt, buckle and holster. Detailed photos of gold belt buckles. The issued Colt 1908 .380 caliber sidearm of Gen. Samuel E. Anderson with extensive military history. The issued Colt 1908 .380 caliber sidearm of Brig. Gen. Garland C. Black with extensive military history. The issued Colt 1908 .380 caliber sidearm of Major Gen. Albert Eger Brown with extensive military history. The issued Colt 1908 .380 caliber sidearm of Major Gen. James Lawton Collins with extensive military history. The issued Colt 1908 .380 caliber sidearm of Lt. Gen. Marshal S. Carter with extensive military history. Model M "U.S. PROPERTY" .380 ACP issued to Brig. Gen. Robert S. Israel, Jr. The issued Colt 1908 .380 caliber sidearm of Brig. Gen. Robert S. Israel, Jr. with extensive military history. The issued Colt 1908 .380 caliber sidearm of Maj. Gen. Alfred H. Johnson with extensive military history. The issued Colt 1908 .380 caliber sidearm of Brig. Gen. Hamilton E. Maguire with extensive military history. The issued Colt 1908 .380 factory engraved and gold inlaid sidearm of Gen. George C. Marshall. The issued Colt 1908 .380 caliber sidearm of Brigadier General Anthony McAuliffe with extensive military history. The issued Colt 1908 .380 caliber sidearm of Lt. Gen. Frank W. Milburn with extensive military history. The issued Colt 1908 .380 caliber sidearm of Brig. Gen. Norman F. Ramsey with extensive military history. The issued Colt 1908 .380 caliber sidearm of Brig. Gen. Lotha A. Smith with extensive military history. The issued Colt 1908 .380 caliber sidearm of Brig. Gen. Joseph Burton Sweet with military history. The issued Colt 1908 .380 caliber sidearm of Brig. Gen. Frank Lawrence Whittaker with military history. The issued Colt 1903 .32 caliber sidearm of Lieutenant General David V. Bennett with accessories and military history. The issued Colt 1903 .32 caliber sidearm for Colonel Ivan Lawrence Brenneman with military history. The issued Colt 1903 .32 caliber sidearm of Major General William S. Coleman with extensive military history. The issued Colt 1903 .32 caliber sidearm of Major General Charles M. Duke with military history. The issued Colt 1903 .32 caliber sidearm of Colonel Carl Rueben Dutton with military history. The issued Colt 1903 .32 caliber sidearm of Major General Edgar C. Erickson with military history. The issued Colt 1903 .32 caliber sidearm of Brigadier General Lester W. Grawunder with extensive military history. 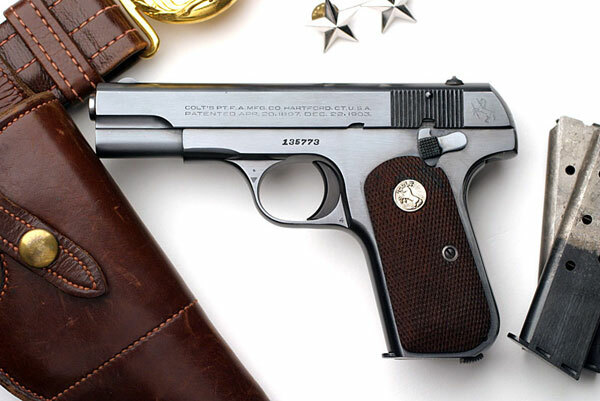 The issued Colt 1903 .32 caliber sidearm of Brigadier General Kermit Hansen with extensive military history. The issued Colt 1903 .32 caliber sidearm of General Ben Harrell with extensive military history. The issued Colt 1903 .32 caliber sidearm of Major General Oliver Clark Harvey with extensive military history. The issued Colt 1903 .32 caliber sidearm of Major General Mervyn Mackay Magee with extensive military history. The issued Colt 1903 .32 caliber sidearm of General George Robinson Mather with extensive military history. The issued Colt 1903 .32 caliber sidearm of Major General Ronald D. McDonald with extensive military history. The issued Colt 1903 .32 caliber sidearm of Major General Lloyd Roosevelt Moses with extensive military history. The issued Colt 1903 .32 caliber sidearm of Brigadier General Robert E. Peters with military history. The issued Colt 1903 .32 caliber sidearm of General Jacob E. Smart with extensive military history. The issued Colt 1903 .32 caliber sidearm of Major General Herbert George Sparrow with extensive military history. The issued Colt 1903 .32 caliber sidearm of Major General Ben F. Taylor with accessories and military history. The issued Colt 1903 .32 caliber sidearm of Col. Howard A. Van Auken, USA. U.S. Navy Contract Pistols One Colt 1903 (Model M) .32 and two Colt 1908 .380 Model M .380 pistols (early and late Navy variations). The issued Colt M15 .45 ACP caliber sidearm of Major General Charles D. Palmer with accessories and military history.